There were small postal offices in downtown DC on Albermarle Street and Wisconsin Ave but the studios were on Kemp Mill Rd, Wheaton, MD and in mid 60`s on Georgia Ave Silver Spring, MD in the World Building. R A Campbell recalls his first 1962 shift at WQMR/WGAY at Kemp Mill Road, was weeknights 6pm to Midnight on FM, (AM signed-off at sunset). Prior to this the FM was running country 45's from a jukbox in a closet just outside the production studio. The jukebox was shut down and the 'great albums of beautiful music' continued through the evening. "I relieved Ken Flynn who frequently hung around to break me up during the 6:30PM news. Once he shut off the lights and I had to read the news from the illumination of the VU meter, at the right, on the Gates Yard console. I recall once I had the hiccups on a `headline news` and had to use five actualities to cover- reading one sentence intros to each. One hiccup escaped during my weather". Campbell became News Director in 1965 and left in 1967 to WRIO in Southern New Jersey as GM. One of the original beautiful music stations was an AM station in Patterson NJ. 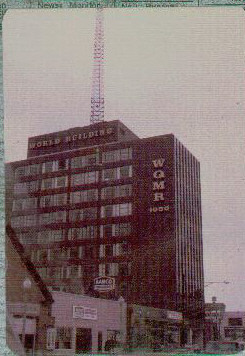 WPAT was getting great numbers in the 'NYC ratings book' in the 1950s. Ed Winton worked with Gordon McClendon in Dallas and built up the numbers of KLIF-FM, & KABL (San Francisco) with the format. Then he moved on to WGAY with the 'Concert Hall' sound. It started out with a heavy echo to add depth, actually it sounded hollow and was dropped for a normal sound. Marlin R. Taylor, the first GM at Bethesda's old WHFS (FM) (Washington's High Fidelity Station) went on to Philadelphia in the early '60's to develop this format on highly sucessful WDVR...WJIB in Boston, then to WRFM, NYC. Originally WGAY, on Kemp Mill Road, was owned by John Kluge, a produce distributor who eventually became METROMEDIA czar. Kluge sold WGAY, a 1kw daytimer, to country music exec Connie B. Gay who obviously kept the call letters. 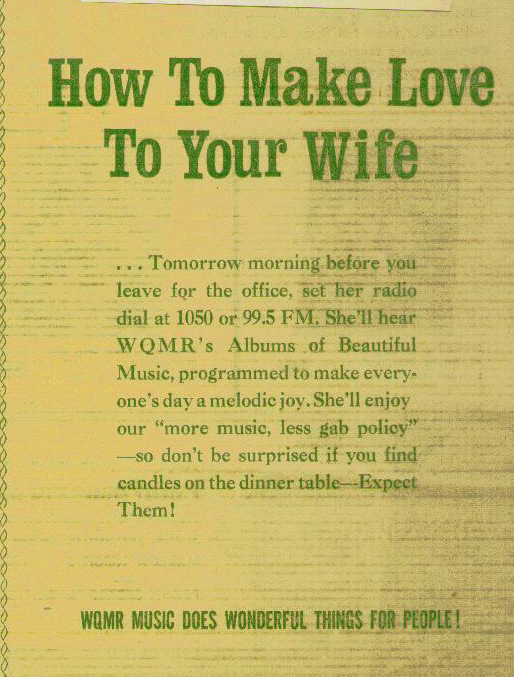 When the 'concert hall' format was established by GM Ed Winton February 1, 1960, the WGAY calls were kept on the FM and AM became WQMR. R A Campbell relates..."When the plans to demolish the Kemp Mill Road studios and move to the World Building were undertaken, Kluge came by to say 'goodbye' he told me he would like to keep some old award memorabilia displayed in the lobby". ADVT material is presented here as part of radio's history, under the Fair Use provision of the copyright law.